Eye is the world’s most beautiful and collectable graphic design journal. It is easily available by subscription (see below) and stocked by many specialist bookshops and magazine stores worldwide. Eye subscribers have their copy of the magazine delivered in a postal carton to their door at no extra cost. If you’re already a subscriber you can manage your subscription online. We value our subscribers and thank you for continuing your subscription. Eye is packed with insight, information and inspiration for anyone studying design, or considering a career in media and the creative arts. Full time students can subscribe to Eye with a discount of up to 50 per cent. Go online, call +44 137 185 1885 or email subscriptions@eyemagazine.com with ‘Student subs’ in the header. You can buy the current issue online. The magazine will be delivered in a postal carton to your door at no extra cost. You can also buy back issues online while stocks last. Alternatively, call +44 137 185 1885 or email subscriptions@eyemagazine.com. 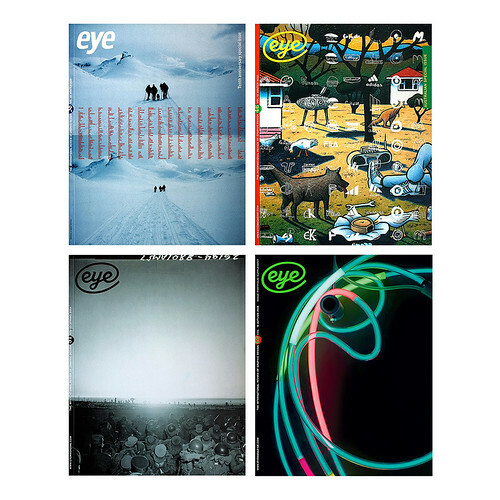 Bargain offer: themed, bundled collections of four Eye back issues at the special price of £45, available online only. There are five bundles in the ‘classic collections’: ‘Storytelling’, ‘Back to the 1990s’, ‘On and Off the Wall’, ‘The Big Picture’ and ‘Type and Lettering’.